EARJ is located close to section B of the Tijuca National Park, as you can see by comparing the school’s position on Google Maps, below, with the picture that shows the boundaries of the different sectors of the park, further down . Even though the city of Rio was founded in 1565, the portion of the Atlantic Forest now protected by the Tijuca National Park remained fairly intact until the beginning of the 18th century. However, from this point on agricultural use of the area grew significantly, first with the sugar cane plantations and later with the coffee plantations. This eventually led to the near total deforestation of the region, exposing the soil, the rivers and the creeks to evaporation and leading in turn to serious water shortages in the city of Rio during the first half of the 19th century. Still in 1856, the city's authorities decided to begin reclaiming the area. The plantations were all removed, and it is estimated that 100,000 trees were planted under the command of Major Archer and Tomás da Gama and of the subsequent administrators of the newly protected area. The ecological initiatives that began to take place back in the 19th century eventually led to the foundation of the Tijuca National Park more than 100 years later, in 1961. The main objective by then was not only to protect the water resources of the city of Rio, but also to protect the fauna and flora of the Atlantic Rain forest within this urban environment. The Tijuca National Park currently covers an area of 3951 hectares of the Maciço da Tijuca, making it extremely mountainous; it holds some of the main mountains and hills of the city including the Serras dos Três Rios, Serra da Carioca and Pedra da Gávea. The park rises behind the Botanical Gardens of Rio de Janeiro to the top of Pico da Tijuca, at 1021m above sea level. The climate of the park is largely tropical, characterized by abundant rainfall all year long and mild temperatures. During the process of reforestation, thousands of different species of trees from nearby areas were planted together with alien species, creating what today is an extremely rich and diversified flora. As a consequence of these changes to the original flora, the fauna of the park does not include all of the animals typical of the Atlantic Rainforest. In addition, since the colonial period the fauna of the surrounding areas of Rio de Janeiro suffers with the urban growth and human pressures. Consequently, there are several species facing extinction, especially larger mammals. Nevertheless, this is still an extremely diverse area in terms of fauna, sheltering a wide variety of arthropods (insects, spiders, etc), amphibians, reptiles (mainly snakes), birds and small mammals. 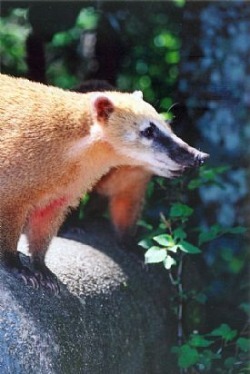 Those animals which have adapted to life in the company of humans, such as the coati and the common marmoset, thrive in this environment.